The Department of Primary Industries and Regional Development, Western Australia has worked with the Indonesian potato industry to increase the productivity of crops planted with WA seed potatoes. Improved productivity requires accurate identification of pests in potatoes and in the cabbage rotation crop. As well as helping Indonesian farmers this information will assist Western Australian seed potato exporters understand the challenges their Indonesian customers face. The Indonesian name for striped cabbage heart caterpillar (or cabbage centre grub as it is known in Western Australia) is "ulat krop bergaris" and the scientific name is Hellula undalis. Striped cabbage heart caterpillar adults are about 12mm long. The upper pair of wings is grey with brown markings. The lower pair is grey and darker at the edges. The wings are held flat. Adult female moths produce a pheromone or scent, which attracts males. Synthetic pheromone lures are available and if this pest is important in particular regions, could be used to help monitor the timing and abundance of this insect. Adults lay oval-shaped eggs singly or in groups. They are laid on the younger parts of plants near the heart from early to mid stages of plant growth. When first laid, eggs are white. They turn pink as they age and before hatching. Larvae are yellow with brown stripes along the length of the body and have a dark head. Striped cabbage heart caterpillar larvae tunnel into the growing tip and seal the tunnel with webbing. Larvae may tunnel into main veins of larger leaves. They grow to about 12mm long. When mature, larvae form a cocoon within the feeding tunnel. When young plants are attacked, they wilt and die. If older plants are attacked, they produce secondary growing tips that do not produce a viable head. 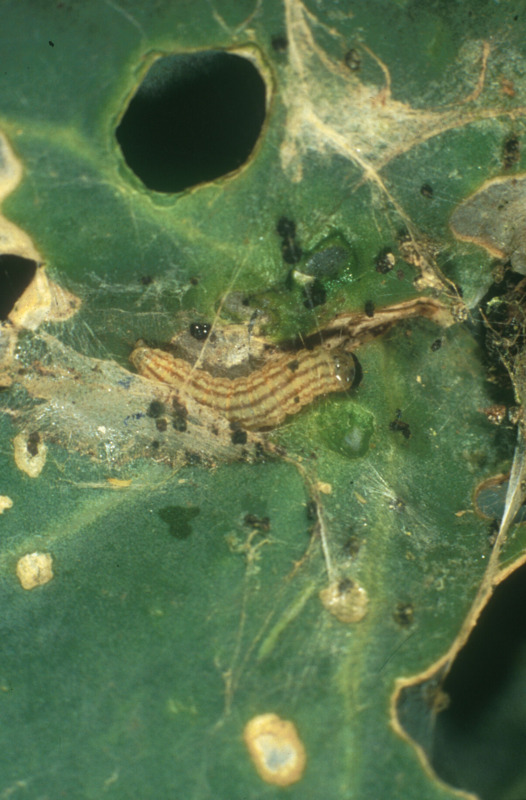 Natural control agents for striped cabbage heart caterpillar include wasp parasites and predators. Their abundance is usually low and cannot be relied upon to protect plants from damage. Monitor crops weekly especially in the early stages of crop establishment and look for damaged growing tips. Check 50 plants across the crop for larvae. Spray when more than 5% plants are damaged by larvae. This equals two to three of 50 plants with live larvae or damaged growing tips. Do not attempt to control moths with insecticide. Choose insecticides that are compatible with preserving natural control agents of the target and other pests in the crop. Funding for this work to support Indonesian potato farmers and WA seed potato exports was provided by ACIAR (the Australian Centre for International Agricultural Research) and the Department of Primary Industries and Regional Development, Western Australia.